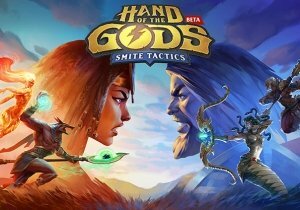 With the impending arrival of Hand of the Gods to its fully released status, I thought I’d try a new, fun HOTG deck! It’s a mid-range, sort of risky deck I call “Ra and Pals”. Also an apology: My screenshots did not come out right, and then overlapped. Dear Hirez, please add a solid screenshot ability for this game! If there is one, I simply have not used it. So, apologies again, and as always, enjoy! So, today I’m trying again, a little something different. One of the decks that have really beat me down from time to time was Ra. I may not have the skill of the pro-HOTG players (due to time constraints if nothing else), but I sat down and considered what about these decks really punished me. It was their ability to lock the board down and prevent anyone from doing anything fun at all. However, this version of a Ra Mid-Range is probably not the same that everyone else is using. It, like me, believes in high-risk-high-reward. You have almost no low-cost cards in this deck and on average (until late game, if you get that far) play one spell/ability a turn. But if you can get lucky, get a few cards on the board early, get the Thoth/Heal death ray going, happy times will ensue. It’s fun, it can have really explosive results, but it’s a deck that requires patience. You can’t just run in and start swinging as soon as you get a few creatures on the board. Most of the deck relies on healing friendly units, so that will require you to use your Ra Leader Ability (which is why I put Gladiator into the deck), or probably Geb (who has an ability that triggers healing passives). Though I did not include Execute, but I’m genuinely considering adding it and removing one or two creatures though I’m not quite sure which I’d get rid of yet. This is why I need a sideboard! It does have a few options for removing creatures from the problem, but every single one of them is random. From Serqet to Last Breath, every card in here that gets rid of creatures is a poison, and you have to wait for it to trigger. So you can still get pounded by Hercules, Skadi, Apollo, or whatever trouble creature is giving you fits. However, if you can hunker down, get those creatures buffed thanks to healing, your opponents will be F6’ing with a quickness you’ve never seen before. Nobody wants to get slapped with a 15/5 in one hit! Though anything that can get rid of a creature, or remove something that has a negative effect (EG: the Roman card Promote was used to replace two poisoned Hercules cards with Sylvanus and Aphrodite and I went from winning to suddenly losing very very hard) is disaster incarnate. But I keep talking about healing. What’s Ra do that is so great that heals? Ra (Deck Leader): Egyptian Pantheon: 2: Restore 1 Health to all friendlies in target column. Characteristics: Almost every card in the Egyptian pantheon takes advantage of this, and many of the neutral creatures will be to your benefit as well. It might be just 1 point of health, but as long as someone in that row was healed, you have Neith suddenly having a global auto-attack (that virtually no one can return fire on. I can only think of one creature that can), Thoth shooting a whole row with 2 damage, Canopic Jar dealing that healing back to the enemy Summoning Stone in damage, or Sobek receiving +1/+1 every time a friendly is healed. It seldom matters if they are healed, just as long as someone on your side is healed! There are a lot of Afterlife affects too, that proc abilities when a unit dies. Popular ones are Scarab’s Blessing that gives a unit “Afterlife: Ressurect”, which kind of speaks for itself. Then there’s Isis, who gives all of your units on the field that effect! Ra plays the long con if you will. Serqet randomly poisons an enemy when she dies, and then there’s probably one of the most disgusting triggers: Khepri. For four, he deals 1 damage to all other units and then heals all the friendly units for one. That means, as long as they can survive that one hit, all those fun healing triggers proc at once! So you pop your Ra heal, play Khepri, then use all your other bonus fun stuff. It’s about putting the board in a position that is beneficial to you, and no one else. Strong/Weak Matchups: Any deck that is slower or as slow as yours should be an easy time. The deck I had the easiest time with was the Hindu deck (sorry Ganesha, I still think you’re great!) and slow versions of Ah Puch. Bellona and Zeus are very much hit-or-miss because it depends on what deck they are running. High-cost, late-game gods can be dealt with, but early game rush down is frustrating. Low-cost Ra decks/Low-cost Nu Wa decks are also an absolute nightmare. This deck is reliant on having the cards you need when you need them, and not having them blown up before your combos can start popping off. It becomes pretty clear if you haven’t played anything in two or three turns what’s about to happen, so any deck that can stop you with Aoe/Creature Removal is a serious threat. Zeus was honestly the hardest deck for me to deal with, and I didn’t play against any Odins, but I imagine if it’s rush-down Odin, I’m going to have a “bad time” ™. Thanatos ruined most of my combos pretty efficiently, stopping me from doing dirty things to the board. Bellona was also able to pull my Thoth back into range of her death machines, and then having two Hercules played back-to-back absolutely stopped my Neith and Thoth from getting online. So this by no means a miracle machine to climb ranked with, but if you like to gamble, I tell you, I’m your man. I love this deck a lot, but there is still a lot of fine-tuning to do. For example, in all of my matches, I’ve seen Isis once, Anubis zero times, Dune Guardian zero times that I can remember. I’ve played Book of the Dead, but it did not offer a comeback mechanic that I was hoping for. All it did was delay the inevitable for one turn. I’m really considering removing those last, highest cards for lower-tier stuff I can use in the early game, like Execute, Cataclysm, Scarab’s Blessing, or Meditation. In fact, I’m going to add Meditation right now, and I have no idea why I didn’t have it in there in the first place. A lot of those higher cost cards simply don’t see enough use, and Meditation is a combo-machine for this deck. In a two-out-of-three with a sideboard, this could be a real threat. It relies far too heavily on getting the right cards at the right time for some people. I imagine some more card draw might make it more ferocious. It seems like anytime I put Chaofeng into play, the entire enemy deck is all ranged, which makes me laugh, but also is terribly frustrating. This is a deck that when all the parts are moving simultaneously, it’s hard to stop. The Gallus can completely stop AOE destruction/executions from going off too (except annoying stuff like Loki/Thanatos). It still needs some fine-tuning, as I expressed earlier. I mean, Hell, I added a new card while doing this piece! I hope in the future, people who play the game and read this will have input, because I’m far from a pro. I just have a lot of experience playing card games. What do you think? Let me know below!